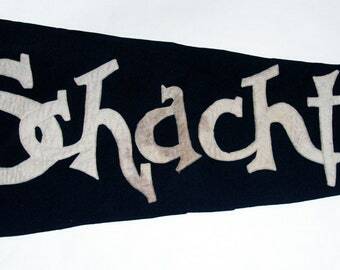 Dating from the 1930s, this early felt pennant for Chicago's New Zoo at Brookfield (which opened in 1934) has white letters in a brushstroke style designed as a subtle evocation of Chinese calligraphy on a red field with a thick three color graphic of the star attraction, giant panda bears. In good condition, with little or no fading, mild soiling, few small tack holes but with some cracking and minor losses to the ink; the four ties are present. • Buyer is responsible for any customs duties. We will not falsify documents for customs. 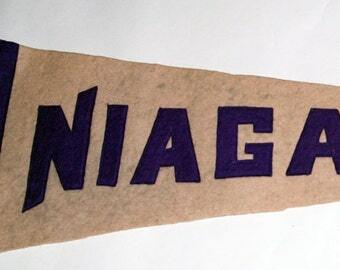 1930s-40s era Felt Pennant Souvenir of Chicago — Free US Shipping! 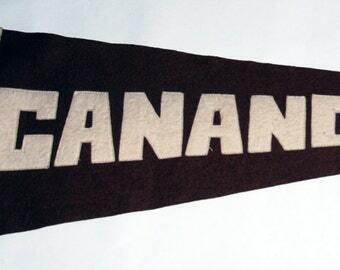 1960s Era Felt Pennant Tijuana Mexico — Free US Shipping! 1940s-’50s era Felt Pennant Souvenir of the Grand-View Ship Hotel, Pennsylvania — Free US Shipping! 1930s-'40s Era Felt Football Pennant Mount St. Michael, the Bronx -- Free US Shipping! 1940s-50s era Belvidere Illinois Souvenir Felt Pennant — Free USA Shipping!